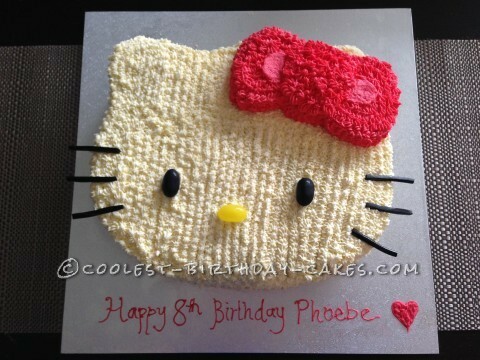 My lovely daughter Phoebe really wanted a Hello Kitty Cake this year for her 8th birthday…. and it had to be a strawberry cake inside. I used a vanilla cake recipe and added strawberry essence with a few red food coloring drops to tint the batter pink. I baked two large rectangle cakes and then printed a Hello Kitty shape off the internet to use as my guide. The cake slowly took shape, but really came together when it was iced. I cut the cake into 2 layers also, and did a layer of vanilla butter cream filling and strawberry jam. The icing was all done in butter cream icing using a star tip. The whiskers where cut from licorice. The eyes and nose are giant jellybeans that happened to be the perfect size and shape.